Best known for his underwater camera work, Eddy Raphael engaged with top advertising director Juurian Booij from Holland, and shark advocate and of Women Divers Hall of Famer, Cristina Zenato to film the new Huawei cell phone commercial, 'The Shark Dancer.' 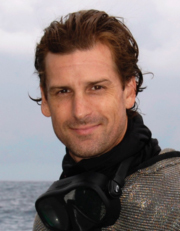 Wearing chain-mail suits and diving closely with sharks, Eddy developed the underwater story, along with Sherman Johnson’s above-water camera work of Cristina’s unique connection with the sharks around Grand Bahama Island. The short film, revolving around the series title ‘The Power Of Touch’, was scheduled to be one of three documentaries. ‘The Shark Dancer’ and the second film made were so incredible that the third film was dropped as the content of the films could not be matched a third time. In ‘The Shark Dancer’ Cristina’s story unfolds at her ‘office’ in the ocean and delves into the deep seated passion and care she surrounds her Caribbean Reef Sharks with. Eddy, a long time colleague of Cristina, was able to portray much of that love and guardianship which emanated a seamless harmony between his and Sherman Johnson’s above-water camera work. Illustrating an enchanting piece of Cristina’s personal world, ‘The Shark Dancer’ is an exhilarating look at one woman’s unique human interaction with some of nature’s most formidable creatures.